Villa Rosa Designs Sheryl Pattern Card. 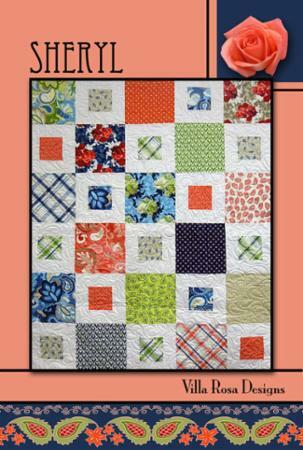 Pieced square within square blocks alternate with whole cloth blocks for a bold graphic look. Finished size 48 x 57 inch or 63 x 72 inch with optional borders. Fat Quarter and Layer Cake friendly. Instructions and diagrams on a 4 x 6 inch full-color card that's easy to slide in your bag for reference when you go shopping.